Perhaps one of the most iconic multi-band portable radios of its time, the ICF-2010/2001D enjoyed one of the longest production runs of any radio, being manufactured from 1985 to 2002. I will admit that I have a particular affection for this model as it was my reference portable radio for many years. 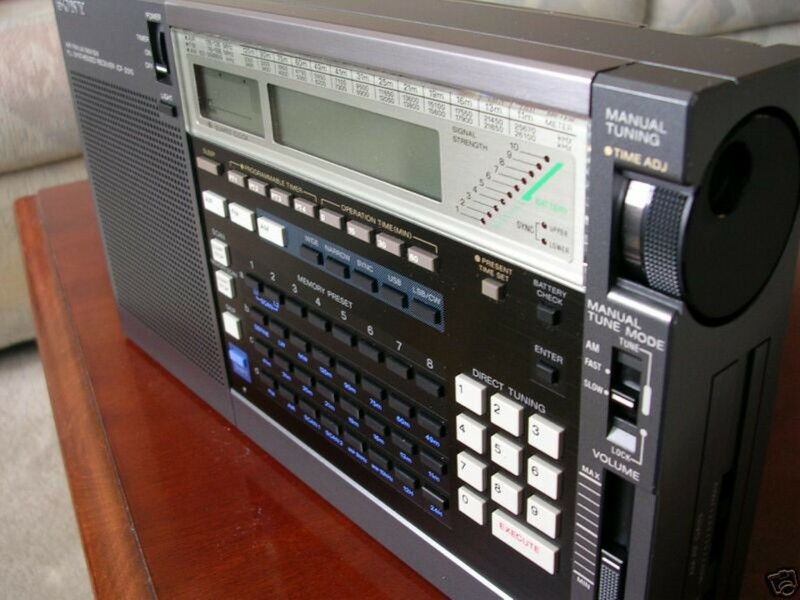 My first shortwave radio was an inexpensive Sangean analog portable. 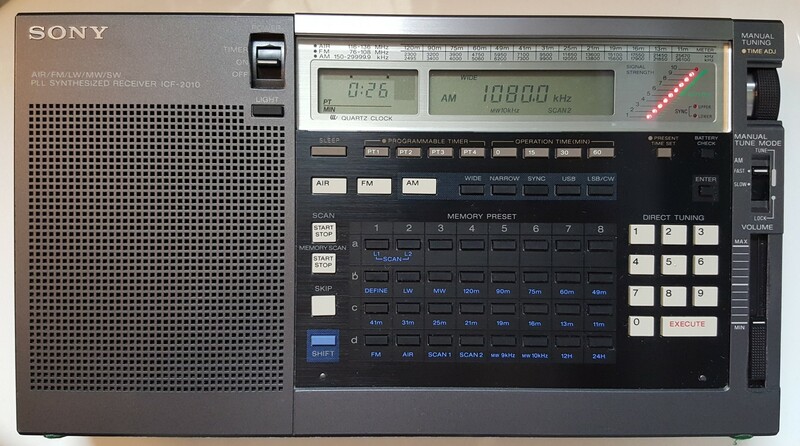 Years later I bought a refurbished Grundig Yacht Boy 400 which was a real step upwards, but after a few years of reading glowing reports about the Sony 2010 in Passport To World Band Radio and elsewhere I finally took the plunge and never regretted it. I’ve owned three samples of the 2010 over the years, all bought new, and have seen many others, but I still own one of my original 2010’s and it still operates flawlessly, although now, with so many radios at my disposal it doesn’t get as much use as it used to. Somehow, I never got around to writing about it so I thought it was time to write a modern day (2018) look and see how it compares with some of the best multi-band portables being produced today. My 2010 has had no modifications whatsoever…it is completely stock. I did align it many years ago…it was very close as received but I wanted to be sure it was as good as it could be. It appears to have held its alignment perfectly. The US version was called the ICF-2010 while ICF-2001D was the model number used in the rest of the world. According to the service manual there were 6 versions sold in different areas. In some countries SSB was deleted and some versions lacked Air Band or parts of the LW/SW/FM spectrum. (You are out of luck if your unit lacks Air Band or SSB, but the deleted frequency ranges can be restored by changing internal jumper patterns). Also, it is easy to confuse this radio with the very different ICF-2001 which was an earlier, completely different radio. What Made The ‘2010 So Special? At the time of its release (1985) the Sony was no less than a breakthrough performer by portable standards in several ways. First, and most important, its AM and SW reception using its built-in antennas was unmatched by any other radio anywhere near its size and price. Its outright sensitivity and ability to capture faint signals which other radios could not hear put it in a class by itself, especially in areas where signals were not as strong as they might be elsewhere. 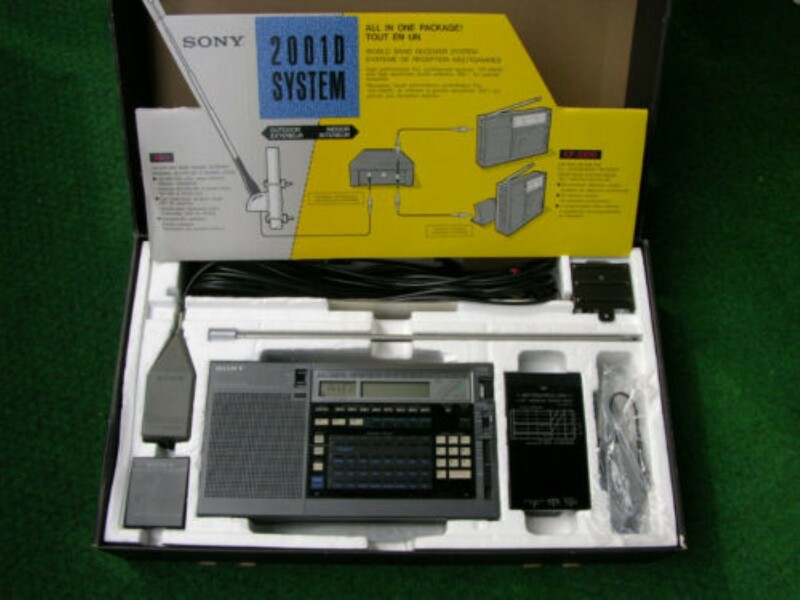 In fact, when Sony eventually replaced the ICF-2010 with the much-updated SW-77 I found the new model to be a bit of a step backwards in terms of raw AM/SW reception, although the SW77 was innovative in many ways, including being Sony’s first model to sport Page Tuning which allowed alpha-numeric station labeling and groupings. (Interestingly, the SW77’s are now developing problems due to failing surface mount components…a problem which the 2010 does not suffer from). The Competition: To be sure, other radios had their devotees…two of the 2010’s biggest competitors were the popular (and excellent) Grundig Satellit 500 introduced in 1989 and Satellit 700 introduced in 1992. Even then, the Grundig’s sync circuitry, although of similar design, was often problematical and not as effective as the Sony’s. In fact, a few Grundig user’s groups published details of modifications that could be made to the Grundig’s sync circuit to make it more closely approximate Sony’s. There was also a known issue with rumbling noises with the Grundig’s sync if certain internal adjustments were not optimized. Aside from that, the Grundigs seemed designed for stronger signal areas, where they handled the extremely strong European SW signals somewhat better, but the flip side of this is that the Grundigs were less sensitive for weaker SW and AM signals. The Grundigs did offer fuller sounding audio, but at the same time they could not match the crispness and clarity of the Sony. Additionally, the Grundig’s FM was more selective than the Sony’s. But on AM the Grundigs sounded somewhat muffled even in the wide bandwidth mode and the noise floor was poorer resulting in a hissy sound on medium to weak AM stations – the Sony delivered AM reception with better clarity and a noticeably lower noise floor. 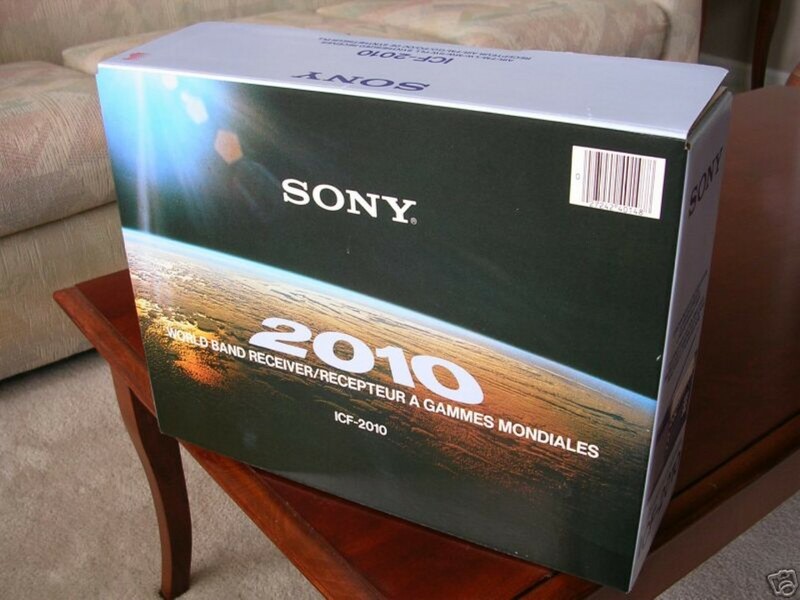 I should also note that the Sony 2010’s superiority was not absolute. I am describing it in the context of lunchbox-sized portable radios of its day. There were and are larger and more expensive radios that will outperform it, but in an apples-to-apples comparison the Sony 2010 was a strong performer. Sony ICF-2010 Design & Features: The 2010 has two signal attenuators: A DX/Local switch and an RF Gain slider. Unfortunately, the DX/Local switch is located after the first gain stage so it is not quite as effective as it might have been, although it still helps. The secondary RF Gain slider is an added convenience and can also be used to bring signal level indications into the most useful range, which can be helpful for example in orienting an antenna for best signal or null. Another area of superiority of the ‘2010 was how well-implemented the digital tuning was. In those early digital days many portable radios tuned poorly, with muting while tuning and/or chuffing noises which disturbed band-scanning. * But the Sony’s tuning knob provided two-speed tuning that was as smooth as silk…virtually like an analog radio with no muting, coarse stepping actions or noises. You could freely spin it using the finger dimple and it had a great feel. In an era where digital memories were a new feature, Sony’s use of 32 dedicated memory preset buttons was (and is) as easy as it gets with no menus to dig through. Those 32 buttons were also labelled in blue with alternate functions which could be invoked by hitting a shift key…an innovative way to expand their capabilities while keeping the layout uncluttered and simple. Today’s radios may sport 1000 or more memories which is great for those who care to figure them out…personally I’ve always stuck to a handful of frequency presets and direct frequency entry methods of tuning which, along with band scanning, seem easier to me than dealing with 1000 memories. *In one way, many of today’s radios have taken a step backward in this regard – they tune with muting which impedes band-scanning. Synchronous Detection: The 2010 was the first consumer portable radio to offer synchronous detection. Sony had already developed an IC to enable AM Stereo which they realized they could also use to provide sync in the ‘2010. In fact, there were articles which outlined how one could modify their 2010 to provide AM Stereo output. The 2010’s sync performance is exemplary both in terms of sync width (the ability to maintain lock even if somewhat off-tuned from the center of the signal), and sync depth (the ability to maintain lock even when the signal fades down to very low levels). It also behaved well when signals faded and dropped out of sync then faded back in… this is crucial to making sync actually usable. Some radios howl and squeal when sync drops out then tries to re-lock as the signal fades back in. If that is happening sync can be more of a frustration than an asset. This excellent sync helped the 2010 despite the fact that its wide filter was considered too wide by some people. Although this very wide filter allowed unusual crispness in the audio, with closely spaced signals it sometimes resulted in hets and squeals as stations beat against each other…but if one sideband was in the clear the excellent sync circuit allowed you to ignore the offending sideband and enjoy clear reception from the other. Of course, one could always go to the narrow bandwidth setting. Some users however wanted something in between those two options so a cottage industry sprang up exemplified by companies such as KIWA to put better filters into the 2010 and these improved filters were well-received by many. To this day some owners still replace the IF filters in their 2010’s. Evidently I am not alone in my continued interest in this radio because the largest Sony 2010 group with close to 3000 members remains very active today. Incidentally the former Yahoo Group migrated to https://groups.io/ as of 2018. A Few Negatives: I always like to remind people that no radio is perfect and of course, the ICF-2010 was not without its quirks. Many one-sheets appeared to help users do simple mods or fixes to keep their radios humming along. Some issues affected only early production units and were soon remedied. One problem area was the holder for the two AA memory batteries. It sometimes failed to provide reliable contact which caused loss of memory and intermittent operation, especially in early production units. I guess I’m lucky that I never experienced this defect in any of my three 2010’s. The easiest fix was to try a different brand of AA battery which might fit more snugly, or to use tape over the AA batteries to hold them in place. Some people also added a memory capacitor across the terminals to allow changing the AA batteries without losing the memories. Some users reported issues with the connections for the D cells as well. Again, I never experienced that issue. Another issue concerned the spring contact for the whip antenna which sometimes failed to make positive contact with the PCB. The fix was to slightly bend the spring contacts to make firmer contact…I did have that issue with one of mine but the fix was easy. Another defect is failure of Q303 (which is a 2SK152-1)…the RF input FET, usually caused by static discharge to an external antenna. Although the whip antenna always had static protection diodes, early production units lacked protective diodes for the Aux Antenna input. It is easy to add such diodes if needed. One other weak area is the mini jacks used for external antennas. They are soldered directly to the PC board and if abused can break loose causing intermittent connections. Sony provided two small antenna adapters…small junction boxes which were designed to make connecting antennas easier and to relieve strain on those mini jacks by letting you connect your external antenna wire to the coupler which then connected to the radio via thin, flexible cables. Even without them, careful users would never connect a heavy coax cable or very large adapter/connector directly to a mini-jack…flexible adapters are widely available through many sources. (You might be interested to know that mini jack breakage was always one of the major failure modes for small portable devices…in the days of the Walkman and competing devices, more units suffered broken jacks than any other failure). FM, LW and Air Band reception are not great…the 2010’s strengths definitely were on SW and AM. FM selectivity can be improved by changing the FM IF filters. The Record Output is not a standard line level output…it was designed to feed the mic inputs of cassette recorders of the day and will provide a weak signal into a standard line level input, although a mod does exist to remedy this if needed. The LED display is small and dim compared with today’s radios…some users replace the LED with newer ones for better illumination. So – How does the 2010 compare to Today’s Best Portable Multi-band Radios? To find out I pitted the 2010 against several top current and recent models, including the Sangean ATS-909X, Tecsun PL-880, PL-660, S-2000/Eton/Grundig Satellit 750, Tecsun S-8800, Eton Satellit Executive, Eton E1, Grundig Satellit 800 and others. As it turns out, the 2010 still holds its own with the best on SW.
On SW using built-in whip antennas the 2010 matches the raw sensitivity of the best of these radios and beats several of them. I did daytime sensitivity tests scanning all of the SW bands, tuning as many signals as I could find on all of the radios and I tabulated the results (a daunting task that occurred over a period of weeks). In no case could I tune in a signal on any of the radios and receive it better than on the 2010, yet the converse was sometimes the case. The 2010 could receive any signal I could hear on any of the other radios. Its sync was also excellent at locking onto and holding weak signals and improving their sound quality…only the Satellit 800 and E1 matched or beat the sync performance of the 2010. The Tecsun PL-660’s sync was very good but not in the same league…the sync in the Tecsun PL-880 and Eton Satellit Executive sounded so bad I judged it unlistenable. I will say that a few of today’s best radios are very similar to the 2010’s SW performance, plus many are smaller and have many added features which can make them desirable, especially for travel where size matters and one doesn’t want to risk damage to a vintage 2010. At night with many stronger signals some of the modern radios fared better. Most of them have numerous IF filter choices which were helpful in some cases. The 2010 still received every signal the newer radios did but their narrower bandwidth options sometimes sounded better. There were still enough faint signals where the 2010 showed its prowess, and its sync was still a great tool to clean up many signals. On SW using External Antennas, two later and more expensive radios – the Satellit 800 and Eton E1, clearly outperformed the 2010. Under crowded band conditions and in the presence of many stronger signals, they were able to resolve some signals which were suppressed on the 2010 because it didn’t match their ultimate rejection and blocking performance…the ability to maintain maximum sensitivity in the presence of much stronger signals. It was sometimes hard to isolate but nevertheless it showed the difference between what more sophisticated, more expensive radios can accomplish. None of the other current portables beat the 2010 in this reception test although some sounded much fuller and more forgiving of poor reception. Most of the portables, the 2010 included, showed more overload than the SAT 800 and E1. True, it could be mitigated by the use of a DX/Local switch or knob but at the cost of reduced overall sensitivity. A good performer in this test was the Sangean ATS-909X, which was no surprise as its admittedly lower sensitivity helps resist overload and has always favored the use of external antennas, whereas radios like the 2010 and the other top portables are designed for maximum whip sensitivity. Anyone with a serious outdoor antenna wanting to use it with any portable radio would do well to consider an external attenuator or pre-selector. Single Sideband (SSB): Here the 2010 turns in decent performance limited somewhat due to its relatively coarse 100 Hz SSB tuning increments. The radio will do well bringing in the SSB signals but you won’t always get as natural audio recovery as you will on a radio with finer or continuous SSB tuning increments…some of today’s radios can present more natural audio with SSB signals. AM Performance: Here the story is bit different. Again, I know some will disagree with me but the 2010 is not among the very top AM performers I have tested although it is close. However, it’s AM reception is better than most other multi-band portables currently on the market. It ranks as Four out of Five Stars in the AM Mega Shootout list which is still excellent and the 2010 also has the advantage of being able to use an external AM antenna via a direct connection…a feature lacking on many of today’s radios and that excellent synchronous detector can sometimes help a fading AM station sound much better. The best of the competitors is the Tecsun S-8800…its sensitivity and noise floor floor beat all the other multi-band (SW capable) radios, although a few frequencies did have spurious birdies which marred reception. It was interesting to me that the Tecsun S-8800 was slightly better than any of the other Tecsuns on AM. In order to find a better performing AM radio on today’s market you will have to forgo SW. As with many radios however be aware that there is some attenuation of AM signals via the Aux Antenna input on the 2010, done to decrease AM breakthrough into the SW bands. You can get full gain by partially inserting the plug into the jack but this is a finicky proposition. (More accurately, there is an additional RF Gain stage for the built-in AM ferrite rod antenna which is bypassed when the Aux Antenna jack is used). FM Performance: Not a strong point of the 2010, the Sony’s FM tuner is reasonably sensitive but not very selective. In remote locations it does alright but with today’s extremely crowded band conditions in most urban and suburban locations it simply is no match for many other radios which far outperform it in their ability to clearly separate closely spaced signals. The best of today’s DSP-equipped (Digital Signal Processing) portable radios can easily separate adjacent FM frequencies which the 2010 cannot due to its very wide FM IF filtering. Some people have installed narrower FM filters in their 2010’s but for the average user the simplest solution is to us a different radio for state-of-the-art FM reception. Likewise, Air Band and LW are only so-so on the 2010. A True Classic: The ICF-2010/2001D remains a classic from Sony’s heyday of cutting edge innovation in the world of portable radios. While, like all radios, it certainly has its flaws, it fits my definition of a classic in many ways. *Arguably the longest production run of any multi-band radio ever made: 1985 – 2002. *Synchronous Detection was ground-breaking in its day and still compares favorably today. *SW whip sensitivity was and is tops in this category…the Sony will receive and make intelligible weak signals as well as any other portable. *AM sensitivity and noise floor are better than any multi-band shortwave radio made today. *An early digital model whose tuning had no digital artifacts – tunes smoothly and naturally with no muting or noises and the free-wheeling knob can be easily spun with a fingertip. *One of the most user-friendly designs ever conceived with 32 dedicated push-buttons to store 32 stations and perform alternate functions with no menus. *Excellent 10 segment LED signal strength meter. *Most 2010’s still work as well as when they were new – unit does not contain failing components such as in the newer (and less sensitive) ICF-SW77. To be sure, the 2010 is not perfect…no radio is. But in some ways it was singularly excellent in its day and is still a joy to use today. I will never part with mine.